Father Adaly Rosado, Jr. was born in the Bronx on the birthday of Our Lady in 1984. He graduated from Dewitt Clinton High School in 2002. He went on to study philosophy at Saint John’s University and graduated with a B.A. in 2007. He graduated from Saint Joseph’s Seminary with in 2011 with a B.A. in Sacred Theology and an Master of Divinity. He was ordained by His Eminence, Timothy Cardinal Dolan on May 14, 2011 and was assigned as the Parochial Vicar of Saint John's in Goshen, NY. From 2013 to 2014 he became a chaplain for AOS-USA, serving on two cruise ships leaving the United States. In 2014 he released Regresen a Jesús, A Spanish Language audio recording designed to help people return to Jesus in the confessional. In 2015 he released El Santo Rosario, La Coronilla de La Divina Misericorida, Las Estaciones de La Cruz for Heart Beat Records. From July 1st, 2014 until June 15th, 2017 he served as the Parochial Vicar at Incarnation Church in New York, NY. He serves on the Advisory Board for the Office of Hispanic Ministry and he is the Co-Chair at the Archdiocesan Level of the Encuentro V moment. 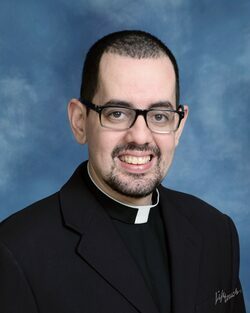 On June 15th, 2017 Father Rosado was appointed Parochial Vicar at Saint Joseph's in Spring Valley, NY. In December of 2018 Father Rosado released "Return to Jesus" a talk on the Sacrament of Reconciliation. Father Rosado speaks English and Spanish. He is looking forward to see you in heaven.